In 1987, Non Ishida, a Japanese graphics editor, wins a competition in Tokyo by designing grid pictures using skyscraper lights which are turned on or off. At the same time and with no connection, a professional Japanese puzzler named Tetsuya Nishio invents the same puzzles. From this, the concept of Pic-a-Pix and picture logic puzzles is born. In 1988, Non Ishida publishes three picture grid puzzles in Japan under the name of Window Art Puzzles and Tetsuya Nishio names his puzzles Oekaki-Logic meaning picture logic or drawing logic. First puzzles start finding their way into puzzle magazines in Japan. In 1990, James Dalgety in the UK invents the name Nonograms after Non Ishida, and The Sunday Telegraph starts publishing them on a weekly basis. In 1990, James Dalgety of The Puzzle Museum in the UK invents the name Nonograms after Non Ishida and The Sunday Telegraph starts publishing Non Ishida's puzzles on a weekly basis. In 1993, the First Book of Nonograms is published in Japan by Non Ishida and The Sunday Telegraph publishes a puzzle collection book titled The Book of Nonograms. Nonogram and Oekai-Logic magazines by Gakken, Sekaibunkasha and other publishers are becoming popular in Japan and starting to be published in the Netherlands, Sweden, United States, South Africa and other countries out of Japan. In 1994, Dave Green, later to become founder and president of Conceptis Puzzles, visits Tokyo where he gets exposed to these logic puzzles for the first time. Together with Igor Lerner, former colleague and current CTO of Conceptis Puzzles, the computer algorithm is developed, the first BW puzzles are produced and the name Pic-a-Pix is invented. In 1995, Pic-a-Pix puzzles start appearing in several monthly puzzle magazines in Japan, some of which contain up to 100 puzzles. Nintendo picked up on this puzzle fad a while back and released two Picross (Picture Crossword) titles for the Game Boy and nine for the Super Famicom (eight of which were released in two-month intervals for the Nintendo Power Super Famicom Cartridge Writer as the NP Picross series) in Japan. Only one of these, Mario's Picross for the Game Boy, was ever released in the United States. In 1996, the Japanese arcade game Logic Pro was released by Deniam Corp, with a sequel released the following year. Both titles are emulated by MAME (Multiple Arcade Machine Emulator), computer software designed with the intent of preserving gaming history and preventing vintage games from being lost or forgotten. 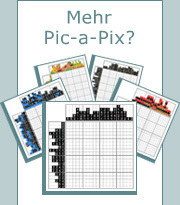 In 1998, the first Pic-a-Pix puzzles by Conceptis are published in the German PM Magazine by Gruner + Jahr AG, the publishers of the famous Stern magazine. The Sunday Telegraph runs a competition to choose a new name for their puzzles. Griddlers was the winning name that readers chose. In 1999, Pic-a-Pix puzzles are published by VNU (currently Sanoma Uitgevers) in The Netherlands, BEAP (currently Puzzler Media) in the UK and Nikui Rosh Puzzles in Israel. In 2000, Tsunami, the first regular monthly magazine dedicated to Pic-a-Pix puzzles was released by BEAP (now Puzzler Media) in the UK and the first two books titled Perplexing Pixel Puzzles and Mind Sharpening Pixel Puzzles were released by Sterling Publishing in the USA. In addition, the pilot issue of Japanse Puzzels XXL was published by VNU (now Sanoma Uitgevers) in the Netherlands, and a special section with 20 Pic-a-Pix puzzles named Paint-by-Numbers is included in the July issue of Games World of Puzzles. In 2001, additional regular monthly magazines dedicated to Conceptis Pic-a-Pix are published in France, Finland and Hungary. At the same time, Pic-a-Pix puzzles by Conceptis start making their way into mixed puzzle magazines in Japan, Italy, Spain and Russia. Today, dedicated and mixed puzzle magazines with Pic-a-Pix by Conceptis are published regularly in the 35 countries including USA, Japan, the UK, Germany, Holland, Canada, France, Russia, Poland, Finland, Denmark, Israel, Hungary, Austria, Spain, Norway, Sweden, Greece, Switzerland, Belgium, Italy, Australia, New Zealand, Czech Republic, Brazil, Turkey, Korea, Thailand, Romania, Philippines, Estonia, Latvia, Peru and more.